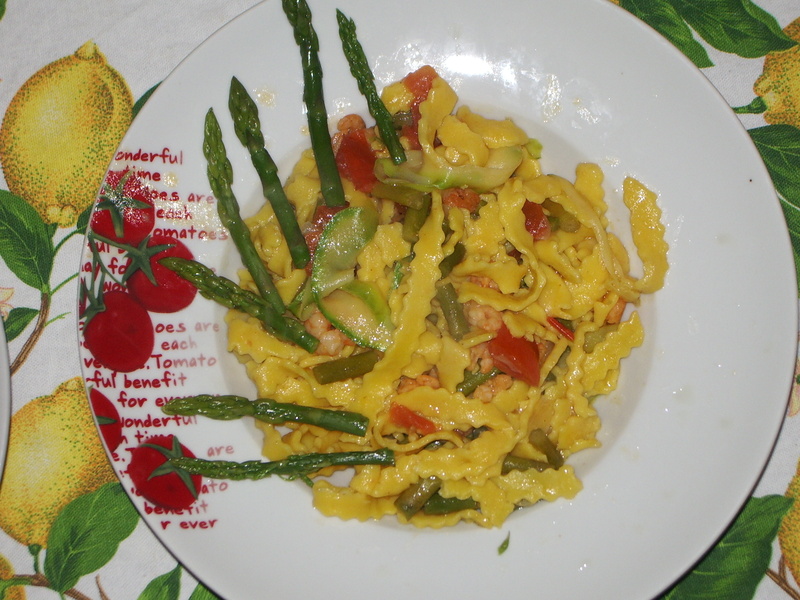 As a tribute to spring, I wanted to share a recipe utilizing the seasonal flavor of asparagus. My husband Michael is an amazing cook—I’m his trusted sous chef—and this afternoon we made tagliatelle pasta with shrimp and asparagus. Please note that these measurements are estimates because Michael never measures things—he’s one of those lucky people who have an innate knowledge of ingredients. An enviable trait, I know. I often tell him he should open his own restaurant…maybe one day! So, this dish is a new favorite and we hope you try it out. Buon appetito! Unlike “regular” pastas eaten throughout Italy, tagliatelle are a traditional egg noodle from Bologna, where Michael studied abroad. The Italian eggs, which have a more orange yolk, allow this pasta to appear yellowish, rather than simply white. He modified this recipe to add a little bit of saffron, which goes quite well with shrimp, and gives the pasta an almost neon-yellow color. 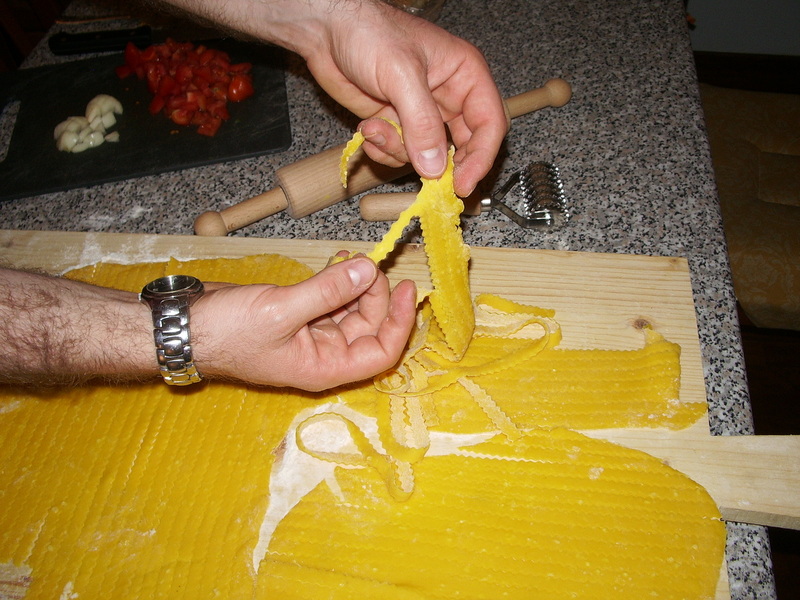 Michael usually makes pasta by hand, but you can also use store-bought fresh pasta—tagliolini or tagliatelle work best. As you make the sauce, boil the water and add sea salt. When the water is boiling, add in your fresh pasta—in about a minute or two they should float to the top, ready. Clean and marinate the shrimp in a mixture that is ¾ water and ¼ lemon juice. You can substitute vinegar for the lemon juice, if you prefer. Cut the tips of the asparagus off from the stalk in about 2.5” inch spears; they’ll serve as garnish. Cut the rest of the stalks into ½-inch pieces. Place the tips in a small pot of boiling water for about 5 minutes, or until they are tender. Using a slotted spoon, remove them from the water. While the water continues to boil, place the ½-inch pieces into the boiling water for 2 minutes. After 2 minutes, remove the pot from the heat, keeping the pieces inside for several minutes. They’ll continue to cook in the hot water, but shouldn’t become as soft as the tips. In a sauce pan, sauté olive oil, diced onion, shrimp and the ½-inch pieces of asparagus from the water (DON’T drain the water; use a slotted spoon). Add chopped tomatoes, salt and pepper (to taste), and sauté until the asparagus is almost tender. Then slowly add in some of the asparagus-flavored water. If you want, add in some long pieces of zucchini (use a peeler to “peel” long, thin pieces of zucchini into the boiling sauce). At this point the pasta water should be boiling; add in your fresh pasta, drain when they’re cooked, and add them to the sauce pan. Toss gently (you don’t want to break the zucchini if you’re using them), adding a little more olive oil, if necessary. Serve, arranging the cooked (and cooled) asparagus tips on top of the plate. If the dish isn’t salty enough, add salt. Just don’t add cheese–as a rule, Italians don’t add cheese to fish dishes. This entry was posted in food, Italy, recipe and tagged food, Italy, pasta, recipe, recipes. Bookmark the permalink.